A researcher at the UPV/EHU participated in a study describing the loss of dynamics and subsequent impairment of the dendritic spines in Alzheimer's disease. Dendritic spines are the compartments of neurons responsible for receiving nerve impulses from other neurons. The researchers report on the role played by the actin cytoskeleton of these compartments and how it responds in the presence of beta-amyloid peptides, the component most commonly associated with Alzheimer's. The study describes the relationship between beta amyloid peptides, components of the plaques that build up in the brains of people affected by Alzheimer's, and the rapid fall in the dynamism of the actin cytoskeleton of the dendritic spines. These reduced dynamics prevent information from being transmitted properly, ultimately triggering the loss of spines and, therefore, the synaptic capacity of the neurons. The cytoskeleton is a three-dimensional network of proteins that provides cells with internal support, organises their structure and intervenes in processes such as intracellular transport or traffic. Dr. Martínez says, "Actin filaments are cytoskeletal structures anchored but constantly moving as if they were an escalator. A protein known as cofilin 1 undertakes to sever the filaments and separate the actin units, a task that keeps the dynamics active." However, if the cofilin 1 has become phosphorylated, that is, if a phosphorous atom is added to it, the protein moves into an inactive state, it ceases to carry out its function and at the same time prevents neural activity from taking place correctly. "In our study, we analysed samples from human brains with Alzheimer's as well as animal models of this disease, and observed that the inactive form of cofilin 1 is present in higher quantities than in healthy neurons." In neuronal cultures, they saw that exposure to beta amyloid peptides, the main components of the plaques or deposits that build up in the brains of individuals with Alzheimer's, leads to an increase in phosphorylated cofilin 1, and therefore causes the actin filaments to become too stabilised; the latter lose dynamism and alter the functioning of the dendritic spines. "Additionally, the beta amyloid peptides lead to fewer spines in the long term—when they cease to be functional, they are gradually lost over time," said Dr. Martínez. One of the pathways of cofilin 1 phosphorylation is a kinase known as ROCK, an enzyme that activates or deactivates other molecules by means of phosphorylation. In the study, the researchers wanted to see whether the drug Fasudil, the function of which is to inhibit the action of the ROCK enzyme, reversed the effect observed in the actin filaments. "We saw that it did. 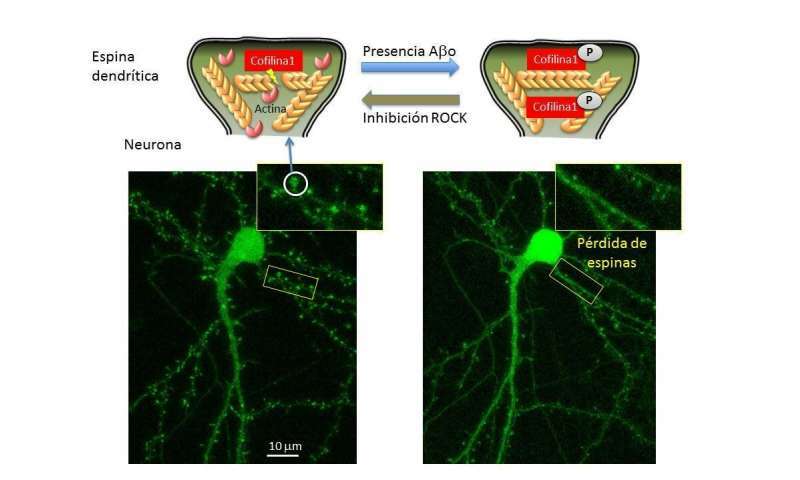 We have not come up with an action mechanism, but we confirmed that the inhibition of the phosphorylation pathway of cofilin 1 prevents exposure to beta amyloid peptides from causing the deactivation of the protein, and the consequent effect on the cytoskeleton of the dendritic spines," said Martínez. "Our results support the idea that the damage caused by the beta amyloid peptides on the level of the dendritic spines during the early stages of the disease may be prevented by modulating ROCK and cofilin 1, and that, therefore, research needs to be conducted into medications that specifically stop that phosphorylation of cof1 in neurons so that future medical treatments to combat Alzheimer's disease can be produced," said Dr. Martínez.